As with many nutrients, people have a general, preconceived idea about their need for dietary fibre. As with many nutrients, those notions come from ad campaigns: orange juice for vitamin C, bananas for potassium and fibre to keep you regular. True, but only part of the picture (for all those nutrients). Fibre is a key ingredient in the Magic Looking Glass for Eating Right for more reasons than pooping well. In exploring the beautiful reflection you see in your meals through the Magic Looking Glass for Eating Right, you are also learning to reflect a deeper care of yourself. This is self-love in action. Eating a balance of nourishing food you enjoy is one of the concrete ways you express self-love – it’s a form of radical self-care. Each of the nutrients in the looking glass framework offer you an important angle for eating right AND show you how you can nourish your best self. 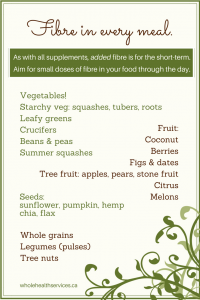 FIBRE PLAYS A VITAL ROLE IN THE OVERALL NOURISHMENT OF YOUR BODY AND SPEAKS VOLUMES TO HOW YOU NOURISH YOUR LIFE. Fibre is a complex carbohydrate, that is, it’s part of our plant-based nutrition. It holds the plant upright by holding water within the plant (think flower stem or celery stalk). It protects and preserves the seed or fruit by preventing water from getting in (a grain’s bran, the coat of a legume, rind). It holds the water necessary for the fruit/vegetable to grow, flower and reproduce. Fibre is either soluble – it can dissolve in water, bulking it up and making it gelatinous or even slimy (tapioca, oats, seaweed, pectin) – or it’s insoluble, like the coats & stalks mentioned above. Because of its structure, the human digestive tract cannot break fibre apart the way it can starch, sugars, protein or fat. Some fibre is so tough we can’t eat it at all (corn husks, shells, avocado or pineapple rind). That indigestibility and its propensity to hold water are exactly how fibre provides its essential functions to the body. Each type of fibre plays a specific role in your body, though fibre in general has many advantages. In your mouth, fibre-rich food require more chewing to break it down. Cooking will also break it down to a certain extent, depending on the method (think steamed, boiled, roasted or raw carrots). The chewing and/or cooking allow you to access the other nutrients bound within the fibre’s strands. As chewing is the first stage of both digestion and immunity in your gut, I’m all for anything that encourages you do it more! Soluble fibre swells with water. This could be as part of your meal, as in chia pudding or oatmeal, or after you eat, when it soaks up moisture from your digestive juices. Note: this capacity of all fibre to hold water is why it’s always important to hydrate adequately when taking fibre supplements and why Health Canada/ FDA put limits on recommended intake (more about that shortly). Both types will feed your gut flora as they move through. Well-fed beneficial bacteria add to your intestinal immune system and provide you with some vitamins B & K.
Insoluble fibre adds bulk to the bolus (the mass of food moving through your GI tract). Your colon is a large muscle that serves to reabsorb water and move the garbage out. The bulk acts as resistance training for that muscle, giving it something to work against so it can function more effectively. Yes, that’s how fibre helps you poop efficiently. When working well that efficiency contributes to detoxification and weight management. How much fibre do you need? Health Canada/FDA say women need 25 g, men 38 g. As with your caloric intake, that number can vary depending on your size, lifestyle and state of health. One good way to tell if you’re getting enough? Read your poop. Of course, this is something to consider in the context of your entire diet, your habits and any health conditions you have, but generally, if your stool is loose or unformed, you may need more fibre; hard & dry, you may need more OR you be getting too much/need more water. Not enough fibre intake can set you up for diseases such as diverticulitis or colon cancer. can irritate the intestinal tract. Best to let your holistic nutrition consultant help you find the happy balance. Let’s take a moment to look at the qualities you gain from having enough fibre in your diet… in your life. They are the qualities we glean from plants as a whole. Think about this as you look through the food sources, which ones you eat, and where you lack in your life. Fibre can be found in its various forms, densities and solubilities in all parts of a plant. Each part nourishes our bodies in its own way; each part teaches us a life lesson in its own way. Do you remember grade 9 biology, when you learned about photosynthesis? That’s when the leaves make sugar by binding water and carbon dioxide with the sun’s energy. Sugar is literally cosmic energy and the building block for all other parts of the plant. 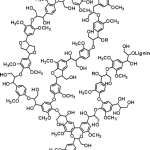 Those sugar molecules link together to make starch, and that most complex polysaccharide: fibre. Fibre is a lacework of that energy. The densest expression of heat and light. It gives strength to the plant; sometimes likened to fibreglass in its durability. Yet it can also be flexible. (Remember, too much and you will become hard and dry in your being. As part of the leaves, it allows that primal reaction to happen by reaching up towards that sunlight. Leaves and their concentration of magnesium nourish your heart, the part of you that reaches for that which you desire, that which lights you up. The stalk reflects your human need for social order. Have you ever looked at the patterns in the way leaves emerge on a stem? The specific shapes of leaves are part of that order in that the shape denotes its purpose. Think of the large leaves of a rhubarb that shade its heat-sensitive stalks or the spines on a thistle that protect the land from invaders. The stalk also speaks to your moral fibre. What do you stand for? Are you capable of standing up for yourself? Fibre holds water, the vital basis of all life. Do your ideas, words and values hold water as well? Are you living in integrity? 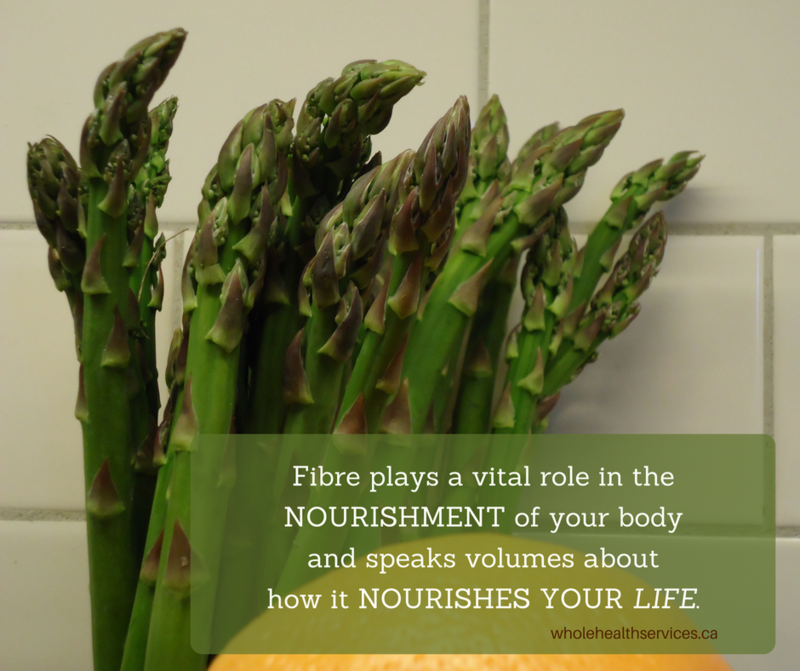 Fibre is the stuff of life that requires you to decide what you must absorb and keep, and what you need to release. Fibre digs deep with the roots that ground you to reality. The formative forces of the earth draw up to nourish that plant and feed your brain. Much subtler – no fibre, but it completes the picture as the last expressions of a plan – is the vibrational energy you receive from plants. The colours, essences and oils that nourish your subtle bodies – your chakras, your emotions and your aura. YOU WANT TO HAVE MORE INTEGRITY, TO BECOME A BETTER, STRONGER, MORE ENERGIZED, MORE LOVING, CONFIDENT AND FOCUSED VERSION OF YOURSELF WITH EVERY FIBRE OF YOUR BEING. Could it be that eating plant food more consciously and conscientiously will help enhance those qualities you seek? Now that you know that fibre is so much more than the All-Bran you sprinkle on your morning yogourt, which ways will you incorporate it into your life? Which qualities do you hope to gain from that addition? When you share your thoughts in the comments, you open the possibilities for others. Share your insights and get your friends in on the conversation by clicking any (or all!) of the pretty green buttons. This entry was posted in Food for your Thoughts and tagged carbs, chew your food, estrogen dominance, fibre, life energy in food, magic looking glass for eating, nourish your body, roots by Cathy Cochrane. Bookmark the permalink.